SOUTHAMPTON, Pa. – Good things came in small packages at Stephenson’s Jan. 1 auction in suburban Philadelphia. An early 19th-century Henry Bower “dwarf” clock standing only 50 inches tall rang in the New Year in fine style, leading prices realized with a buoyant selling price of $31,625. All prices quoted include 15% buyer’s premium. The diminutive walnut clock sourced from an estate in Pennsylvania’s Poconos region gave indications early on that it might be a sizzler on auction day. The winning bidder, an antique dealer and clock collector, called Cindy Stephenson a few days after the auction and told her he was having a gear made for the clock to ensure it would be in perfect running order going forward. “He was very happy with the clock. He told me he had sold a few other dwarf clocks over the years, but never one by that particular maker,” Stephenson said. The clock had passed by descent to the estate from which it came, but no other information was known about its ownership history. Its desirability was validated on auction day, however, when 11 phone lines were required to accommodate all phone bidders. “Every phone line in the house was occupied, including all of our personal cell phones,” said Stephenson. The other big story of the day was an old and well-provenanced collection of ivory and jade that had come to Stephenson’s from a Montgomery County residence. Its contents attracted many bidders in the gallery, online and on the phones. A pair of circa-1890-1920 Chinese carved ivory figural urns decorated with relief village scenes and foo dogs had formerly been in the collection of Oliver Smalley of Epsom, England. Estimated at $2,000-$4,000, the matched duo sold online for $6,490. 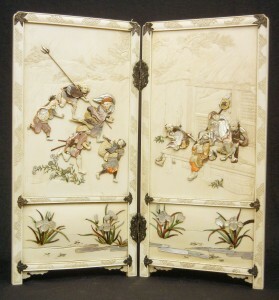 A beautiful 19th-century Japanese ivory and shibayama table screen encrusted with mother of pearl and decorated with tinted-ivory relief figures of people running in the rain and huddling in a shelter was bid to an above-estimate price of $7,475. Other Asian highlights included a carved white jade Buddha, $5,605 to an online bidder; and a celadon jade figure of an official with a scepter, $5,750. “Our buyers were very pleased with the Asian selection we offered. The pieces were just fabulous. And the consignor was so pleased with the results, he’s also going to consign his furniture. We’re certainly looking forward to that,” said Stephenson. Of the antique silver offered in the sale, a circa-1814 George III inkstand with winged paw feet, hallmarked for Rebecca Emes and Edward Barnard, London, more than doubled expectations at $1,725. It sold to a buyer in the gallery. The top jewelry lot was a man’s hand-made 18K gold ring with a bezel-set center diamond weighing approximately 2.0 carats, surrounded by 58 round champagne and white diamonds. It surpassed presale expectations, selling via the Internet for $5,015. An Alexander John Drysdale (American/New Orleans, 1875-1934) Louisiana bayou landscape artwork has returned to familiar surroundings after selling to a Louisiana phone bidder for a within-estimate price of $2,300. “The buyer was very pleased, and so were we. It’s always nice to see regional art returning to its place of origin,” said Stephenson. Stephenson’s has a full slate of auctions planned for the first quarter of 2013. For additional information, call Cindy Stephenson at 215-322-6182 or e-mail info@stephensonsauction.com. Online: www.stephensonsauction.com. Lot 410 – Pennsylvania walnut miniature tall case clock, Hy (Henry) Bower, F. (Feste) Swome, early 19th century. Top lot of the sale: $31,625. Stephenson’s Auctioneers image. Lot 105 – Pair of Chinese carved ivory figural covered urns decorated with figural village scenes, foo dogs, circa 1890-1920, ex collection of Oliver Smalley, Epsom, England; $6,490. Stephenson’s Auctioneers image. Lot 109 – Ivory and shibayama table screen encrusted with mother of pearl and tinted ivory, figurines in rain and shelter, signed on one panel, Japan, 19th century, $7,475. Stephenson’s Auctioneers image. Lot 160 – George III glass and silver inkstand, winged paw feet, engraved on back ‘Dame SJ Paston-Cooper,’ circa 1814, hallmarked for Rebecca Emes and Edward Barnard, London, $1,725. Stephenson’s Auctioneers image. Lot 235 – Man’s handmade 18K gold and diamond ring; center bezel-set stone approx. 2.0 carats; additional 58 round champagne and white diamonds, weight 40.4 grams/26.0 dwt, $5,015. Stephenson’s Auctioneers image.